Willem de Sitter’s father, Lamoraal Ulbo de Sitter, descended from a patrician family in Groningen, a university city in the north of The Netherlands. 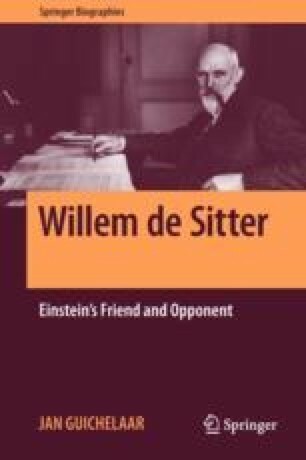 His father, also named Willem de Sitter, published in 1885 a genealogy of the De Sitter family. In this book the family tree was traced back to the beginning of the fourteenth century, to Flanders, now in Belgium. Roughly thirty years later a book from a different member of the family, Mr. J. H. de Sitter, appeared (De Sitter 1916). In that booklet the latter mentioned “besides a lot of good information, also serious inaccuracies” in the genealogy. The official survey of the Dutch patriciate, in The Netherlands the so-called blue booklet, follows the data of this J. H. de Sitter. In the blue Dutch Patriciate, edited since 1910, families are incorporated, when they have uninterruptedly played a prominent role in Dutch society for more than 150 years. He mentions the 16th century Nicolaes (also: Nicolas) de Sitter (also: de Zuttere or de Zittere) as descendant from the West Flemish villages Yperen and Bailleul, close to each other. During skirmishes before the Eighty Years’ War (1568–1648) of the Dutch Republic in the making against the Kingdom of Spain, where the Spaniards regularly intervened, this Nicolas de Zittere was summoned before the bailiff of Bailleul in 1567. Thereupon he fled to Antwerp with his son, also named Nicolaes, where he became a police master. After the overthrow of Antwerp in 1585 he left for Leiden. He was a fortunate man, married three times and died there in 1601. From the register of deaths in Leiden it shows that his father was named Willem. In everything he did a certain casual fearlessness characterized him, perhaps related to the unshaken independence, which revealed in him the descendant of a patrician family (Huizinga 1935).